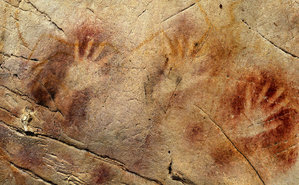 Pigment was blown onto the cave walls using hand stencils, perhaps by Neanderthal? 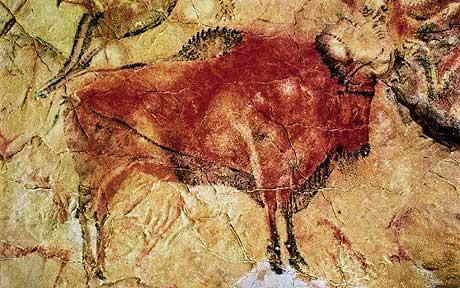 While writing my previous post related to the knowledge of ancient man, I was concerned about pushing the limits of accepted timelines around the Lascaux cave paintings of France. The conservative dating of most cave painting sites around the world have always been considered to be roughly 17,000 – 24,000 years ago. Recently, this thinking has changed as a result of a new archaeological technique that measures the growth of tiny stalactites on top of the paint pigments. 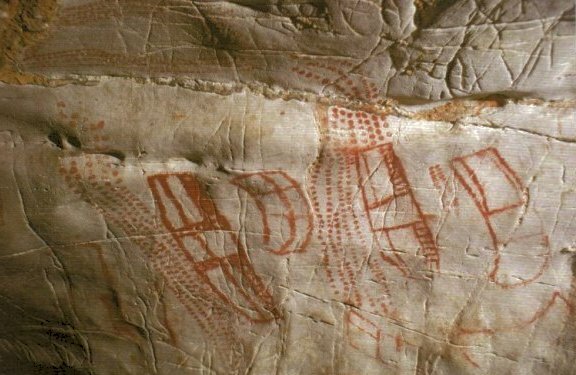 Using this method, the world’s oldest cave paintings have been dated in Northern Spain within a series of 11 caves; the most prominent being at El Castillo. It appears that not only are many of the finds at least 40,000 years old, but according to researchers may have been created by Neanderthal. Another interesting facet of this discovery is that these cave paintings were created over a period of more than 20,000 years; which is two to four times longer than Lascaux site is thought to have been maintained. Many people have accused me of trying to portray ancient man as a ‘Noble Savage’. The argument most of these critics give is that ancient myth, religion and knowledge are useless to study because ancient man didn’t understand the world in the way we did today. People can’t get past the fact that ancient cultures used stories filled with anthropomorphic figures (part-man, part-animal beings) and other symbolic metaphors. It doesn’t occur to people that it would be difficult to pass down knowledge to an ancient audience in a way they could not only understand it; but themselves repeat it. In my opinion, shamanism and myth/story telling was the instrument for both passing down this knowledge and the framework for preserving succession so that this knowledge could continue to be propagated. Chinese Stock Bubble Only in China? Global Cooling, a Possible Solar Correlation? US Calls out China ‘Hacking’ – Evidence?